Google Translate is a free service provided by Google Inc that lets users translate text documents, websites and other text from one language to another. Google translate French to English translates between these languages easily. To get the best results with the tool, use the Google translation tips and tricks outlined in this article. You can also learn when it makes sense to use a different translation service instead of Google Translate. After all, Google translate may not be able to tell the differences between different dialects of French or process technical language properly. 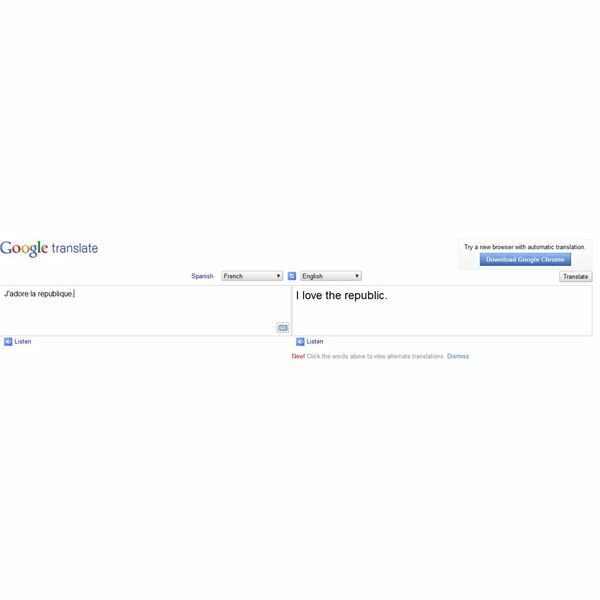 Google provides several different ways of using Google Translate. If you are a frequent user, you may want to use Google Chrome or the Google Translate app for Android phones to access the service more frequently. This section outlines some you can access Google Translate. Use the Google Translate Website: You can copy and paste text right into the Google Translate website and the service will attempt to detect the language for you and produce a translation. If the language is detected incorrectly, you can change the settings. In addition, you can upload text files to Google Translate if you wish to translate a larger document. Google Chrome: Google's web browser, Google Chrome, has a built-in capacity to use Google Translate and other Google services. Google Chrome is also designed to quickly and easily access other free Google services. Google Translate Mobile App: Accessing Google Translate on Android smartphones is easy. The Google Translate mobile app currently supports text translation for a number of languages including French to English. A new capability to translate spoken words is currently under development as well. Google Translate can be thought of as a highly sophisticated digital dictionary with some ability to process grammar. Like all Google products and services, Google Translate is regularly improved and updated. To get the best results and understood the limitations of the service, review these suggestions and tips. French Dialects: If you are using Quebec French, commonly used in the Canadian province of Quebec, Google Translate may not be able to translate all of the local words properly. If you suspect a word or phrase is not being properly translated, try translating that word on its own. Pay attention to all accents: French, unlike English, uses a wide variety of accented letters such as: á,é, ê, and ç. Not all writers, particularly those with weak French skills, properly format accents when writing French. To get the best results, check to make sure all the proper accents are in place if you are getting poor results in Google Translate. Check French verb tenses: French has more verb tenses than English (e.g. passé composé and imparfait). If the tenses are not properly written in the original text, Google Translate may produce an incorrect or confusing translation. Using legal, scientific and technical French: Using Google Translate to produce a translation of a contract, medical article or technical instructions may produce poor results since these documents involve complicated words and phrases. You may need to consult a specialized French-English dictionary or a translation company in those situations. To learn more about all the features and options available when using Google translate French to English text translation, explore the resources provided in this section.